Russell W. Hartigan, of the Chicago firm of Hartigan & O'Connor, was appointed by the Illinois Supreme Court yesterday to fill the countywide vacancy created by the retirement of Judge John J. Moran. The appointment is effective October 14, 2010 and will terminate on December 3, 2012. Hartigan was a candidate in this year's primary for the countywide Riley vacancy. He finished second to Sandra Ramos, the candidate slated by the Democratic Party. (Ramos is unopposed on the November ballot.) In the course of his campaign, Hartigan obtained endorsements from the Chicago Tribune, the Chicago Sun-Times, the 19th Ward Democratic Organization, the Wheeling Township Democratic Organization, the IVI-IPO, Personal PAC, and the Illinois Civil Justice League. Hartigan was rated qualified or recommended by every bar group that screened his credentials for the primary. 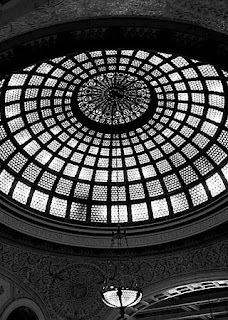 He garnered a "highly qualified" rating from the Chicago Bar Association, the CBA noting that Hartigan "has practiced a wide range of complex civil litigation matters. He has tried a variety of civil jury trials. He is respected by his peers and possesses an excellent temperament." Hartigan also received a "highly qualified" rating from the ISBA and was "highly recommended" for judicial office by the Decalogue Society of Lawyers and the Lesbian and Gay Bar Association of Chicago. The Alliance of Bar Associations for Judicial Screening is comprised of the Asian American Bar Association of the Greater Chicago Area (AABA), Black Women Lawyers’ Association of Greater Chicago (BWLA), Chicago Council of Lawyers (CCL), Cook County Bar Association (CCBA), Decalogue Society of Lawyers (DSL), Hellenic Bar Association (HBA), Illinois State Bar Association (ISBA), Lesbian and Gay Bar Association of Chicago (LAGBAC), Puerto Rican Bar Association of Illinois (PRBA), and Women’s Bar Association of Illinois (WBAI) working collaboratively to improve the process of screening judicial candidates in Cook County, Illinois. The Chicago Council of Lawyers has released the explanations of its ratings for the coming election. For the complete report, follow this link. The CCL noted that Judge Jones opted not to participate in the CCL evaluation process. In an article in this evening's Chicago Daily Law Bulletin, John Flynn Rooney reports that Judge Jones chose not to participate in any bar evaluation. "I don't participate in the [bar groups evaluation] process because unfortunately I don't think it's fair," Jones told Flynn in an interview. "I let the people decide." Bio: Judge Laurence Dunford was elected to the bench in 2004 and is currently assigned to the First Municipal District. Judge Dunford was admitted to practice in 1971. Prior to election, he was in private practice. Judge Dunford presents a difficult case. Most respondents say that he has a good knowledge of the law and with adequate legal ability and temperament. But other respondents find fault with his temperament, saying that he can be short-tempered and unpredictable from day to day. The Council concludes that he is Not Qualified for retention. Judge Jeffrey Lawrence was elected to the bench in 1992. He is currently assigned to the Law Division. Previously, he was in the Domestic Relations Division. Judge Lawrence was admitted to practice in 1969. Prior to election, he was in private practice. Judge Lawrence is considered to have good legal ability. He is a capable judge who is praised for his ability to handle more complex cases. However, the Council is concerned that there are numerous reports that Judge Lawrence is not punctual in terms of starting his court call. This is a complaint that lawyers have directed at Judge Lawrence since the 1998 retention election evaluation conducted by the Council. In addition, there are lawyers who report that he is sometimes not prepared for their cases and that he is sometimes intemperate on the bench. On balance, the Council finds him Not Qualified for retention. Judge Patrick T. Murphy was elected to the bench in 2004, and serves in the Fifth Municipal District Domestic Relations Division, where he runs the Unified Family Court Project. Previously, he served in the First Municipal District and the Sixth Municipal District Domestic Relations Division. Judge Murphy was admitted to practice in 1964 after earning his J.D. Prior to election, Judge Murphy served as the Cook County Public Guardian. He was also an assistant Cook County state’s attorney, an attorney with the National Legal Aid & Defender Program and Legal Assistance Foundation, and in private practice. Judge Patrick Murphy is considered to have very good legal ability and is held in high esteem by many for his work as Public Guardian prior to the time he took the bench. But many practitioners report that he is inconsistent in his rulings as a judge. They say he often makes inappropriate, sometimes insulting remarks to the parties in front of him. Some say that he fails to follow the law, ruling in a way that he believes is correct. He is considered to be an advocate rather than a neutral arbiter. The Council respects Judge Murphy for his commitment to reform but finds him Not Qualified for retention to the Circuit Court. Judge William O’Neal was elected to the Circuit Court in 1992. He has served in the Sixth Municipal District since his election. Judge O’Neal was admitted to practice in 1971. Prior to election, he was in private practice and had been a Cook County Public Defender. Judge O’Neal is reported to demonstrate concern about each defendant who comes before him. His integrity is unquestioned. However, many lawyers question whether he always follows the law. In addition, some lawyers complain about his impatience on the bench. The Council finds him Not Qualified for retention. 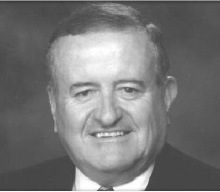 Judge John Turner was elected to the Circuit Court in 1998. He is currently assigned to the Sixth Municipal District and was previously in the First Municipal District. Judge Turner was admitted to practice in 1984. Prior to election, he was an attorney for the Chicago Transit Authority, for the Chicago Park District and both with the Office of the Public Guardian and the Illinois Department of Children and Family Services. Judge Turner hears misdemeanor cases. Some lawyers say he can be short-tempered on the bench and others complain that he does not always apply the law to the facts. Many other lawyers, however, say that he is doing an adequate job in his current assignment. On balance, the Council finds him Not Qualified for retention. Judge William D. O'Neal was "not recommended" by the CBA because he did not participate in that organization's evaluation process. 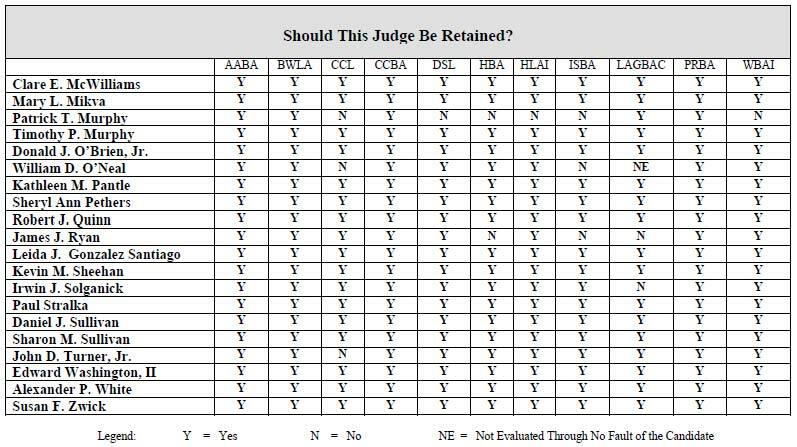 However, Judge O'Neal received "yes" recommendations from the AABA, BWLA, CCBA, DSL, HBA, HLAI, PRBA, and WBAI. Judge O'Neal did receive "no" recommendations from the CCL and the ISBA, but was recommended for retention by the JPC. Judge Jim Ryan received positive ratings from the AABA, BWLA, CCL, CCBA, DSL, HLAI, PRBA, and WBAI. The JPC recommended Judge Ryan's retention, but the CBA did not. Three Alliance members made "no" recommendations, however, namely, the HBA, ISBA and LAGBAC. Judge Jeffrey Lawrence received a negative recommendation from the JPC and a positive one from the CBA. 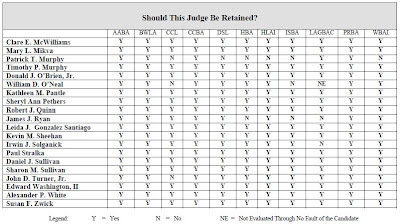 Eight of the 11 Alliance Bar Associations rated Judge Lawrence favorably (the AABA, BWLA, CCBA, DSL, HLAI, LAGBAC, PRBA, and WBAI), although the CCL, HBA and ISBA made negative recommendations. Judge Patrick T. Murphy is “Qualified” for retention as a Circuit Court Judge. Judge Murphy was admitted to practice law in Illinois in 1965. Judge Murphy practiced law for 40 years prior to his election to the Circuit Court, including over 25 years as the Cook County Public Guardian. Judge Murphy is well-known for his diligence, punctuality, and hard work. Those who appear before him find him to be earnest with a good grasp of the law. Judge Murphy’s integrity is unquestioned and he has demonstrated the requisite qualities necessary to serve as a Circuit Court Judge. The Commission notes that Judge Murphy is conscientious, knowledgeable and committed to the best interests of children involved in the divorce proceedings. He has made extensive contributions to the community during his legal career. However, while the Commission believes Judge Murphy should be retained, we have received reports that Judge Murphy can be, at times, intemperate and inconsistent in his rulings. 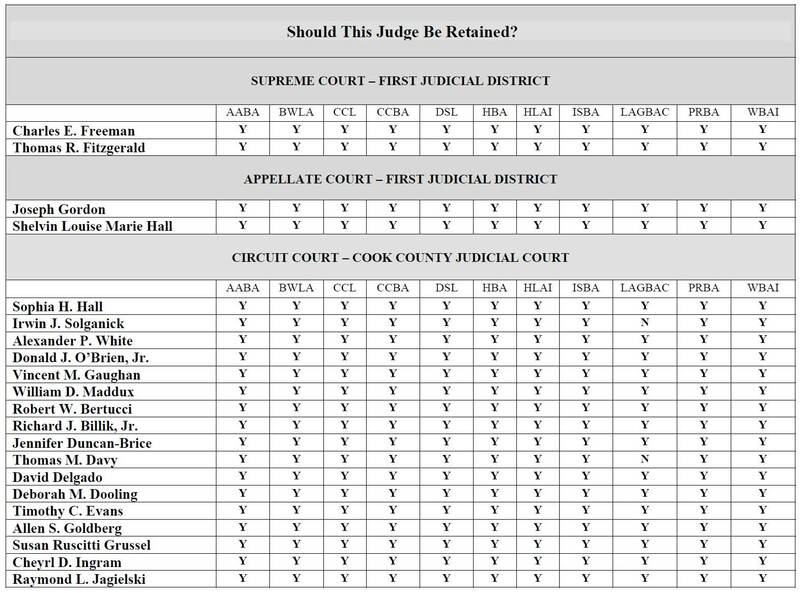 No other Cook County Circuit Judge seeking retention received more than two negative ratings from the 11 member bar associations. 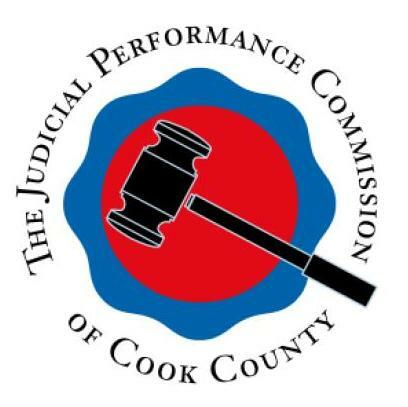 The new Judicial Performance Commission of Cook County has released its report on the qualifications of Cook County Circuit Court judges seeking retention. The entire JPC report may be found at this link (PDF format). (For more about the Judicial Performance Commission, see this post or JPC's own explanation of its history, purpose and methodology)(PDF format). The Judicial Performance Commission does not recommend Judge Jeffrey Lawrence for retention. Biography: Jeffrey Lawrence graduated from Chicago-Kent College of Law and was admitted to practice in 1969. Judge Lawrence was elected to the bench in 1992. He is currently assigned to the Law Division. Previously, he was in the Domestic Relations Division. Prior to election, he was in private practice. Judge Jeffrey Lawrence is "Qualified" for retention as a Circuit Court Judge. Judge Lawrence was admitted to practice law in Illinois in 1969 and has served as a judge since 1992. Judge Lawrence is currently assigned to the motion call in the Law Division. Judge Lawrence possesses the requisite legal knowledge, ability, and integrity to be retained. The JPC recommended two judges for retention that the CBA refused to recommend. The CBA automatically rated Judge William D. O'Neal 'not recommended' because he refused to participate in the CBA evaluation process. The JPC, however, stated, in summary, that "Respondents generally felt that Judge O’Neal makes appropriate rulings. While the Commission believes he should be retained, the Commission notes there have been some concerns raised about his temperament and ability to maintain order in the courtroom." On balance, though, he was recommended. Judge Jim Ryan was also rated 'not recommended' by the CBA but 'recommended' by the JPC. Of Ryan, the JPC said, in summary, "Survey respondents generally found Judge Ryan to be efficient and appreciate the deliberation he gives to defendants during the preliminary hearings heard in his courtroom. He manages his call efficiently and maintains a good relationship with court personnel. He is praised for being fair to all defendants when making his rulings." The JPC added, "While the Commission believes he should be retained, the Commission notes significant reports that Judge Ryan sometimes seems impatient and inattentive during court." It's not up on the Illinois Supreme Court website yet, but both the Chicago Sun-Times and the Chicago Tribune are reporting that Chief Justice Thomas R. Fitzgerald will step down from the high court in October and that the court has agreed to appoint Mary Jane Theis, currently serving as a justice of the Illinois Appellate Court, First District, to replace him. Justice Theis's appointment would be effective through December 3, 2012. She would have to be elected to that vacancy in 2012 in order to continue to serve. Justice Theis received her B.A. degree from Chicago's Loyola University in 1971 and her J.D. degree from the University of San Francisco School of Law in 1973. She served as an Assistant Public Defender (1974-83), Associate Judge (1983-88) and Circuit Judge (1988-93). She was elected a Judge of the Appellate Court, First District, in 1994. Judge Theis is a member of the Illinois State and Chicago Bar Associations, the Women's Bar Association of Illinois and the Illinois Judges' Association. She was President of the Appellate Lawyers Association in 2006-07. Update: Supreme Court press release on Justice Fitzgerald's retirement and Justice Theis's appointment is now posted. I put a post up over the weekend about a former Michigan Supreme Court Justice (Cliff Taylor) who, despite having lost his retention election, still favors the election of judges. Yesterday, my attention was called to Dan Eggen's September 10 article in the Washington Post. In his article Eggen dismissed Mr. Taylor's position without even referring to him by name. Instead he referred to "a report issued... by a small conservative group active in judicial elections" and written by "Colleen Pero, a Michigan judicial activist." In fairness, the September 9 post on The BLT: The Blog of LegalTimes (the original source for my weekend post) referred to both a speech by Mr. Taylor and a report written by Pero, who served as Taylor's campaign manager. The LegalTimes piece focused on the speech; the Washington Post article focused instead on the accompanying report. But the larger question is how did the debate on merit selection vs. judicial election get swept up into the never-ending 'conservative' vs. 'liberal' debate? In what way is appointing judges, thereby bypassing the electorate, 'liberal,' while electing judges is somehow 'conservative?' Answer: It comes from the partisans' belief that their system will help assure judges sympathetic to their views. In my opinion, for all the rhetoric about judicial independence and integrity, many of the persons trying to transform the ongoing discussion of merit selection vs. judicial election into another front in the Culture Wars are looking to control judges, not free them. The "sloganization" of merit selection vs. judicial election is a disservice to the public and to the serious-minded people on either side of the debate. Honest advocates of merit selection will acknowledge that the problem with merit selection is the identity of the person or the composition of the group charged with making the appointments. The last two governors of Illinois have been convicted of felonies. Looking back, would anyone seriously have preferred them to have made judicial appointments rather than have open elections? If the governor were required to appoint persons recommended by a board, who would be on that board? Would the 'blue-ribbon' appointees be overwhelmed by the political interests? On the other hand, honest advocates of judicial elections must acknowledge that the problem with elections is money. Fund-raising (even through committees), electioneering, party nominations, advertising -- all of these can contribute to a perception of partiality among those who survive the process toward those who helped them survive. The truth is that there is no manner and method of judicial selection that, in and of itself, guarantees the integrity and independence of the persons selected. Political considerations can taint any system, elected or appointed, that the human mind can imagine. In Illinois, we have at present a system of electing judges. Whatever we might do in the future, voters can make the present system work best by knowing as much as possible about the men and women who would seek to sit in judgment. For more on the question of merit selection vs. judicial election, Andrea Lyon published this piece yesterday on the Huffington Post. See also, this story on Slate.com regarding former Supreme Court Justice Sandra Day O'Connor's campaign for merit selection of judges -- and how that's playing in Iowa these days. WBBM Radio and the Chicago Daily Law Bulletin are both reporting this evening that Judge Timothy C. Evans has been reelected as Chief Judge of the Circuit Court of Cook County. All Cook County Circuit Judges were eligible to vote in the election, which was held this afternoon in the Daley Center. 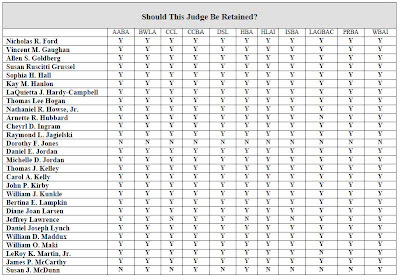 Supreme Court Justices Thomas R. Fitzgerald and Charles E. Freeman were both rated "qualified" in their retention bids, as were Appellate Court Justices Joseph E. Gordon and Shelvin Louise Marie Hall. Judge Jim Ryan is “NotRecommended” for retention as a Circuit Court Judge. Judge Ryan was admitted to practice law in Illinois in 1992 and was elected to the Circuit Court in 2004. Judge Ryan does not possess the requisite legal knowledge, ability, and temperament to serve as a Circuit Court Judge. 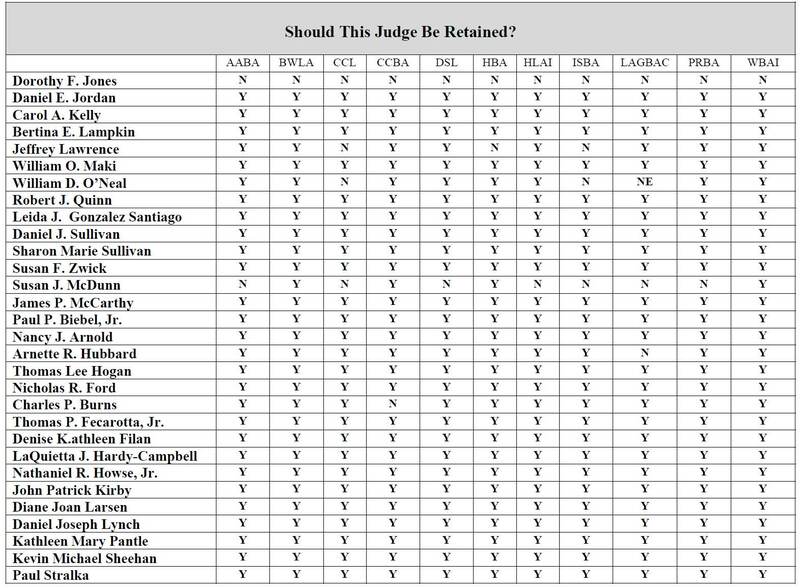 The Illinois Civil Justice League is asking all Illinois judges seeking retention to complete a questionnaire. 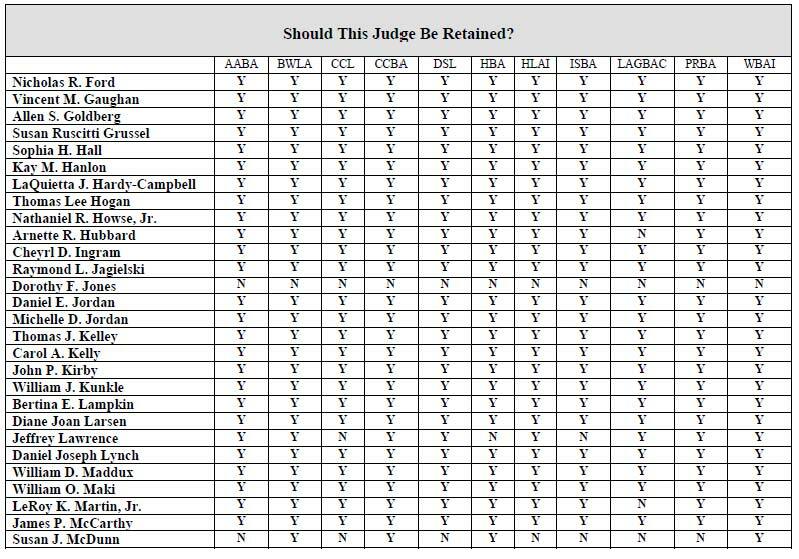 The responses from Cook County jurists will be posted on this page at IllinoisJudges.net. 1. State the main reason why voters should return you to the bench. 2. What actions have you taken as a judge of which you are most proud? 3. Name and describe one change you would make in the Illinois court system. 4. One prominent Illinois judicial evaluation survey asks attorneys to evaluate candidates on Integrity, Impartiality, Legal Ability and Temperament. Critique yourself in these four areas as to how you personally approach your job as a judge? My thanks to the ICJL's Allen Admoite for sending a copy of the ICJL survey my way. 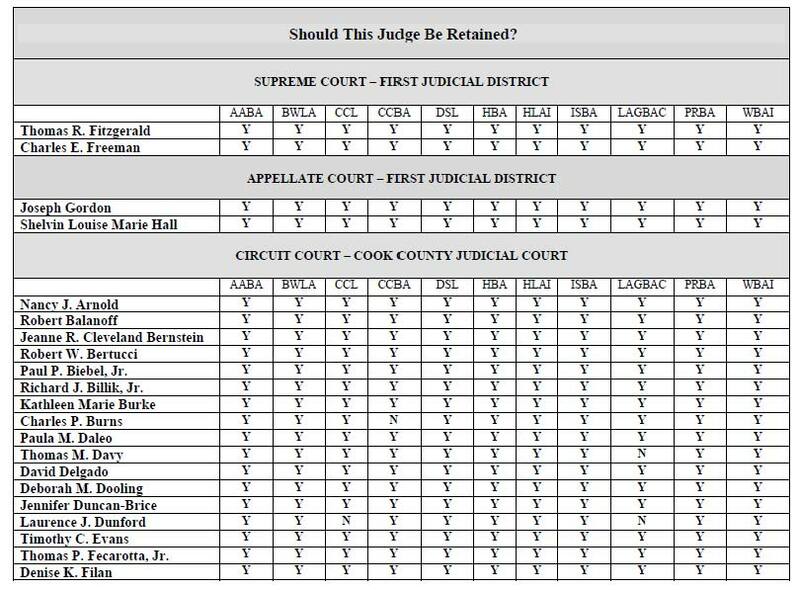 If you know of other questionnaires that Cook County retention judges are being asked to answer, please leave a link in a comment or send me an email. One would understand entirely if a Michigan high court judge, defeated for retention after a bruising election campaign, became a convert to the cause of merit selection. But former Michigan Chief Justice Cliff Taylor, however, still supports the popular election of judges according to the linked story published Thursday on BLT: The Blog of LegalTimes. Cliff Taylor, former chief justice of the Michigan Supreme Court, voiced his support for the system that removed him from office during a panel discussion today about merit selection and its power to reshape America’s state courts. Taylor and former campaign manager Colleen Pero addressed the gathering sponsored by the Heritage Foundation. They released a study underwritten by the American Justice Partnership, and written by Pero, asserting that billionaire George Soros has spent $45 million to "hand judicial selection over to small, unaccountable commissions comprised of legal elites." With respect to Mr. Taylor, I suspect that there was significant support for merit selection before George Soros took an interest in the issue. Further, if Mr. Soros closes his checkbook tomorrow, interest in merit selection will remain. On the other hand, I can't help but believe that true "merit selection" of judges is attainable, even under our present elective system, so long the public is informed about the merits of would-be judges. The trick, of course, is in informing the public. The Illinois Supreme Court has selected Assistant State's Attorney C. Kate Moreland to fill the countywide vacancy created by the retirement of Judge Victoria A. Stewart. Moreland, an attorney since 1995, has been based in Markham. Moreland's appointment is effective September 20, 2010. It terminates December 3, 2012. Per email received this evening from Mary Trew, the Illinois Judges Foundation will hold a fundraiser, "Batter Up For Justice," on September 23 at the Sheffield Baseball Club, 3619 N. Sheffield. For the $150 admission price, guests will receive a dinner buffet, unlimited beer, wine, and soft drinks and -- you knew there'd be a downside didn't you? -- a "great view" of the Cubs-Giants game across the street at Wrigley Field. There will also be a raffle featuring several items of Cubs and Blackhawks memorabilia. The event starts at 5:05pm; the game starts at 6:05pm. For those willing and able to contribute more than the price of admission, sponsorship opportunities are available, ranging from an "On Deck" level at $500 to a "Grand Slam" level at $2,500. To purchase tickets, or for more information about sponsorships, follow this link. the Judge Harold Sullivan $5,000 annual scholarship award to one of the nine Illinois law schools. For more information about Batter Up For Justice, call (312) 554-2008 or (773) 780-9991. Mary Trew writes that she and Diann Marsalek are both serving on the Lawyers Auxiliary Committee for this event. My invite to the September 20 fundraiser hosted by the "Citizens for Retention of Judges in Cook County, 2010" arrived in the mail this week. Full disclosure: If I can scrape up the requested $125 donation, I plan to attend this function, which will run from 5:00 to 8:00pm in the Preston Bradley Hall of the Chicago Cultural Center, 78 E. Washington Street. Entertainment, says the invitation, will be provided by "Judge Gregory Paul Vazquez & His Jazz Ensemble." This is the one fundraiser held on behalf of all the retention judges in Cook County and it will be extraordinarily well attended. Judicial retention elections are a strange thing. 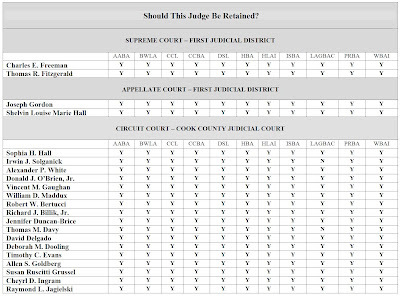 The 70 judges up for retention in Cook County this year do not run against anyone; the candidate's name is on the ballot in the form of a question that comes down to this: Should Judge X remain a judge? Or should Judge X look for work elsewhere come December? 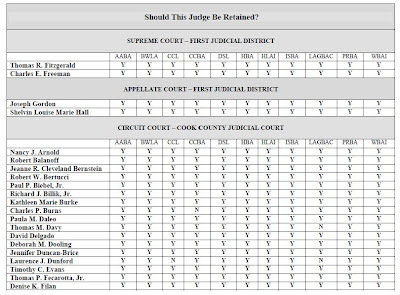 It is rare indeed for a judge to thrown out of office at a retention election; the last time any Cook County judges failed to achieve a 60% yes vote was in 1990 when seven judges were removed (though one was simultaneously elected to the Appellate Court). But that doesn't mean that judges have no reason to take retention elections seriously. 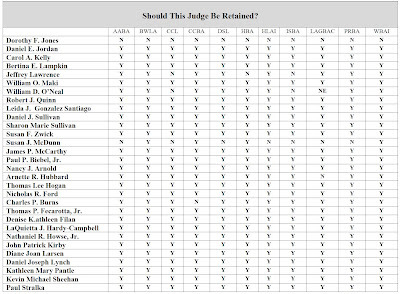 It is a fact that at least two out of 10 voters will mark "no" on every single judge, no matter how qualified. In the 2008 retention election, for example, only one Circuit Court judge received more than an 80% "yes" vote (and she received, by my calculation, 80.1%). Thus, the stars of the newspapers' editorials, the individuals rated most highly qualified by all the various bar groups, can still expect to be rejected by 20% or more of the voters -- and that's in a normal year. Across the nation, there is evidence to suggest that the theme of the current election cycle may be "throw the rascals out" -- rascals being loosely defined as anyone holding office. We have many very good, hard-working, scholarly judges in Cook County. There will also be some judges on this year's retention ballot who, in the opinion of some bar associations, or some newspapers or community groups, should join the ranks of the unemployed. Usually, there will be some disagreement: Judge X may be rejected by one bar association, but recommended by another. It is up to the voters to educate themselves, in these cases, as to which bar association, or which newspaper editorial board, has the correct view. I will try and report the good and the bad, the agreements and the disagreements, on various retention candidates in this blog. But the default vote on the retention ballot, in the absence of a good reason to vote otherwise, should be "yes." And that is why I plan to buy my ticket for September 20.